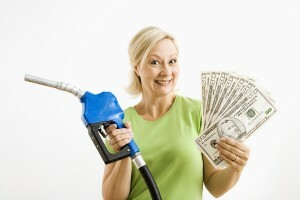 Check out these ten easy ways to save money on gas. After all, we all want a little more jingle in our pocket. Keep your tires inflated to the recommended pressure. Not only will this save you money on fuel, it will also help your tires last longer and improve your vehicle’s performance on wet or icy roads. Replace your air filter according to the manufacturer’s recommended schedule. Try to avoid drive through lines at restaurants, banks and elsewhere. An idling car is only burning fuel. With today’s modern starters, you will save gas by parking and going inside. Use a GPS or get a map app on your smart phone. They will help you find the best route. They can also help you avoid traffic jams. When getting fuel, fill up early in the morning or at night after the sun goes down. Use your cruise control. Just don’t use it when the roads are wet because this can be a safety hazard. Get rid of anything extra you are carrying around in your trunk or back seat. Park in the shade to avoid unnecessary fuel evaporation. Try to anticipate traffic lights. Don’t accelerate knowing the light 1000 feet ahead is going to be red when you get there. Also, drive the speed limit. Lights are often timed based on the speed limit and putting the pedal to the medal when the light turns red will often result in an unnecessary stop at the next light. Download and use an app that finds the lowest gas prices near you. One good app is Gas Buddy. Just be careful because it does not distinguish between cash and credit prices.